While the global cotton industry continues to face a number of challenges — trade uncertainties, slowing economic growth and weakening demand — consumption is still expected to set an all-time high in 2019/20, reaching 27.3 million tonnes. That record-breaking number still won’t be enough to keep global ending stocks from rising by the end of the 2019/20, however. 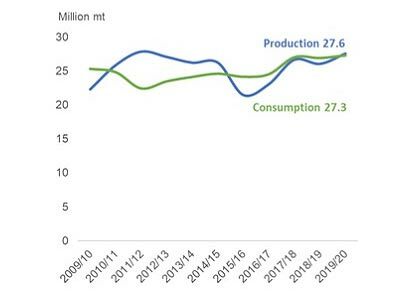 Total production is projected to reach 27.6 million tonnes, a number boosted in part by a 6% increase in global yields, which should leave 17.7 million tonnes in the world’s warehouses at the end of next season. 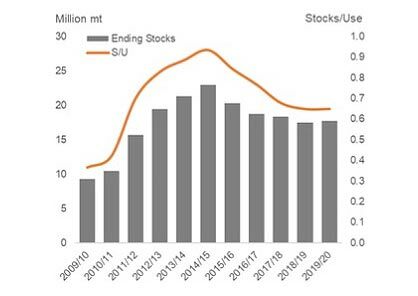 According to ICAC’s price projection, changes in market fundamentals — particularly the stocks-to-mill-use (SMU) ratio outside of China — will drive a decrease in the A Index, which is now expected to drop to 81.25 cents per pound in 2019/20.